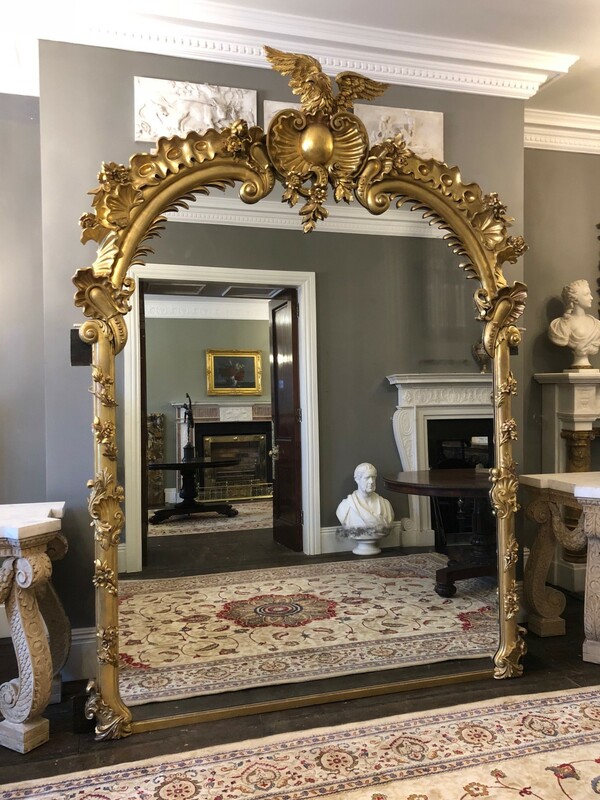 A carved gilt-wood mirror of very large scale and great quality, made by Froom & Cribbs of London. 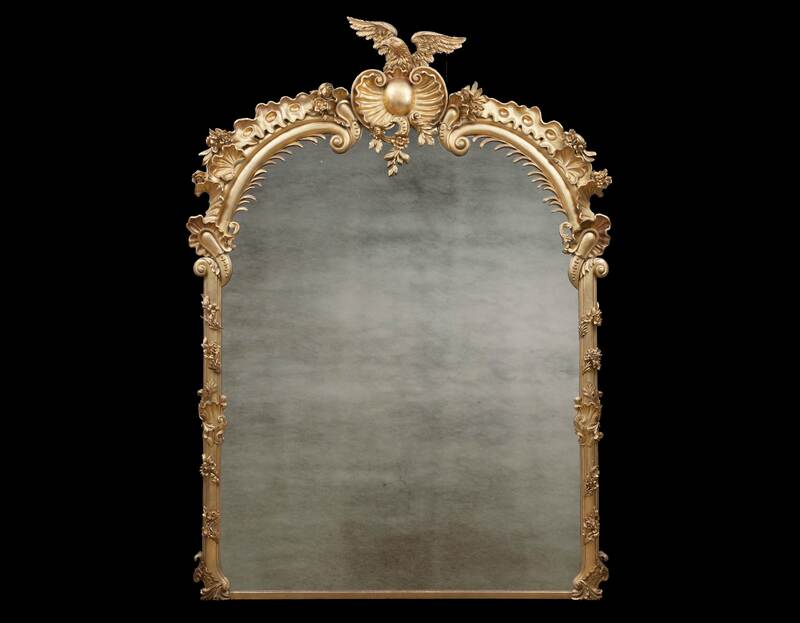 The beautifully carved wooden frame decorated with flowers and foliage. 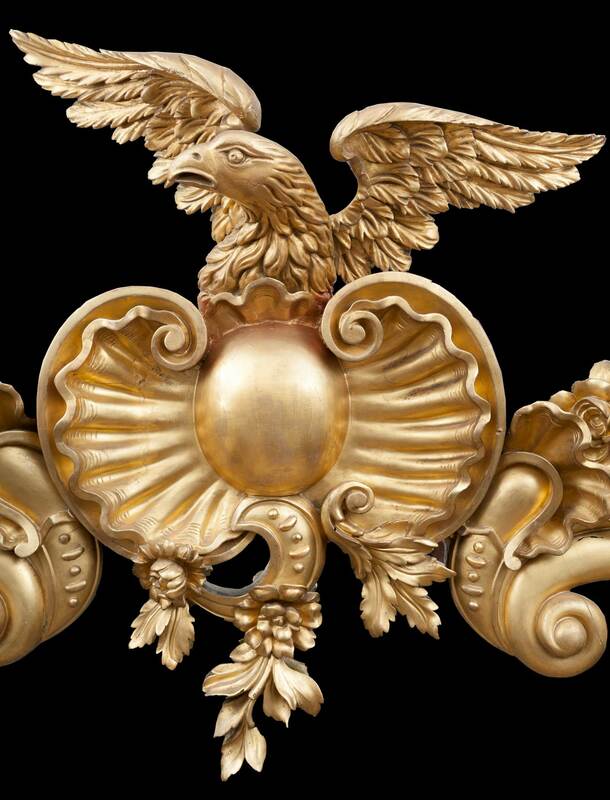 The scrolled arched top centred by an open scallop cartouche with cresting eagle. Both the frame and glass are in good condition. Stamped on the back with documented and important London makers name and address. Froom & Cribbs 1832-1849. At 136 Strand, London. Carvers and gilders, looking glass manufacturers, picture frame makers. William Froom (1791-1865) was christened in 1791 at St George the Martyr, Southwark, the son of William and Martha Froom. He first comes to notice in 1825, when he attended a meeting of more than fifty master carvers and gilders who resolved to resist the demands of journeymen for an increase in wages (The Times 30 June 1825). 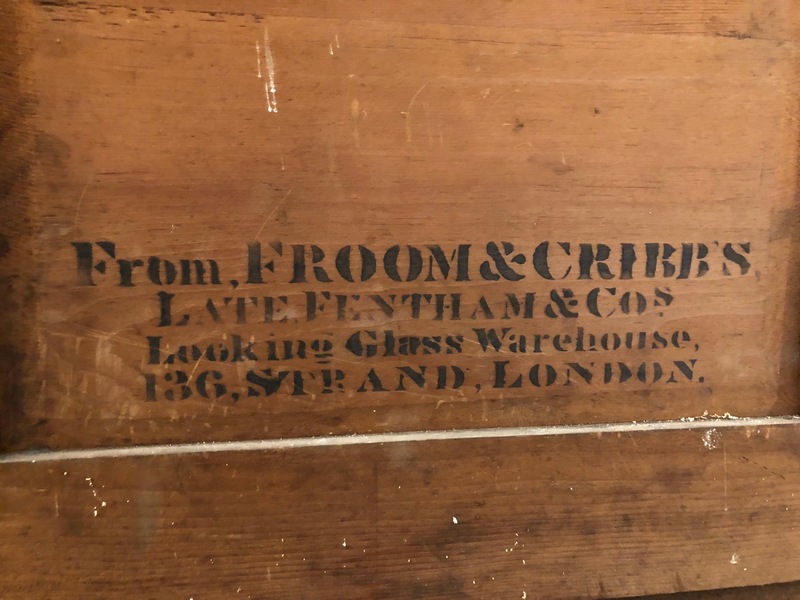 He followed Fentham & Co (qv) at 136 Strand, using the description, ‘Late Fentham & Co’, on his trade label for many years. By 1829 Froom had entered into a short-lived partnership with William Cribb (qv), which was dissolved in 1831 (London Gazette 3 May 1831). William Froom and his wife Elizabeth Anne had five children born between 1831 and 1840, christened at St Mary-le-Strand.William Froom was a customer of the composition ornament maker, George Jackson & Sons (qv), 1836-42 (see Jackson account book, V&A Archive of Art and Design, AAD/2012/1/2/3). In the 1839 directory Froom was listed as a looking glassmaker and in the 1841 census as a plate glass manufacturer. He would appear to have retired from business in 1849 from his entries in the Post Office directory. In the 1851 census he was living in Oxford Square as a landed proprietor. He died on 9 April 1865 at 71 Gloucester Terrace, Hyde Park, leaving a very considerable sum of up to £100,000 to his wife and family, but without mentioning his former business.Both William Froom’s trade label and that of Froom & Cribb, from 136 Strand, list the business as ‘Looking Glass Manufacturers, Carvers and Gilders, and Picture Frame Makers’, describing the premises as being near Somerset House. An example of Froom’s label, as ‘W. Froom’, can be found on a convex mirror of about 1825 (repr. Sotheby’s New York 16 April 2005 lot 46, information from Edgar Harden), while that of Froom & Cribb can be found on the frame of an impression of Henry Dawe’s mezzotint, John Philip Kemble as Hamlet, published 30 March 1827 (Christopher Lennox-Boyd collection). A slightly later label, as ‘William Froom’, from 136 Strand, describes the premises as being near Waterloo Bridge (example on James Ramsay’s Ann Hodgson, c.1830, information from Elizabeth Robertson, 1992).